Police fired tear gas and stun grenades at protesters in Ferguson, Missouri on Monday, after days of unrest sparked by the fatal shooting of an unarmed black teenager by a white policeman. The police action came after hours of street protests that had been tense but mostly peaceful, Reuters witnesses said, adding that a projectile hurled from a crowd of protesters shattered on the ground and erupted into flames. Protesters threw small projectiles, possibly rocks, at police clad in riot gear and flanked by armored vehicles. Police arrested at least four people. One police officer was overheard on a CNN broadcast saying there was a “gunshot victim” as he ordered news media to clear the scene. Missouri’s governor had lifted a curfew for the St. Louis suburb of Ferguson on Monday as National Guard troops were called out. The National Guard deployment was the latest step by authorities to end the looting and burning of stores that have punctuated protests and stirred questions about race relations in the United States since the shooting death of Michael Brown, 18, on Aug. 9. Governor Jay Nixon, who had declared a state of emergency for the town on Saturday and ordered the streets cleared for a curfew that ran from midnight to 5 a.m., said the National Guard would fall under the supervision of the Missouri Highway Patrol. National Guard troops could be seen walking on the fringes of the gathering, keeping a distance from protesters. President Barack Obama said he told the governor the use of the National Guard should be limited, and urged healing, instead of violence. Attorney General Eric Holder will travel to Ferguson on Wednesday, Obama said. Protesters would not be allowed to congregate on the streets on Monday, the Missouri State Police captain in charge of the scene had told reporters earlier in the day. The Federal Aviation Administration said it had renewed a ban on low-flying civilian aircraft over Ferguson to help law enforcement authorities do their job. Getty photographer Scott Olson, with cameras around his neck and his hands bound behind him, was led off the street by police. Getty Images said in a statement it stood behind its photographer and was working to secure his release. At least one other person was seen being taken into custody by about a dozen police officers. The president met Holder on Monday to discuss the unrest. Holder said more than 40 FBI agents were canvassing Ferguson neighborhoods in an investigation that included federal and local officials. “Moreover, at my direction, an additional medical examination is being performed on the body of Michael Brown,” Holder said. Results of official autopsies by federal authorities and the county are pending. An autopsy conducted on behalf of Brown’s family showed he was shot at least six times, including twice in the head. The path of one bullet indicates he may have been lowering his head in surrender when the fatal shot hit, according to Brown family attorney Daryl Parks. According to police, the officer involved in the shooting said he fired initially after Brown reached into his police car. Parks told a news conference one bullet hit Brown in the very top of his head and another shattered his right eye. “His head was in a downward position,” Parks said. “Given those kind of facts, this officer should have been arrested,” Parks said. There were no signs of struggle with the officer and no gunshot residue on the body. Darren Wilson, 28, the officer who shot Brown as the teenager was walking through a Ferguson residential neighborhood with a friend, was put on paid administrative leave and is in hiding. Edward Magee, a spokesman for the St. Louis County prosecutor’s office, said the case could be presented this week to a grand jury, which will decide whether Wilson will be indicted. Most of the town’s 21,000 residents are black, with many saying the shooting was emblematic of police excesses, a charge authorities deny. According to Ferguson police, Brown and a friend were walking down a road when Wilson asked them to move onto the sidewalk. Wilson reported that Brown reached into his patrol car and struggled for his gun when he fired the initial shot. Brown’s friend Dorian Johnson, 22, said Wilson had reached out his car window to grab Brown and the teenager was trying to get away. Johnson said Brown held up his hands to surrender but Wilson got out of his car and shot him several times. The National Bar Association, the country’s largest network of black attorneys and judges, filed a lawsuit on Monday against Ferguson and its police department, calling on them to protect evidence of the shooting and arrests made during protests. Looting has left several stores in a shambles and police have said they have been attacked with petrol bombs. 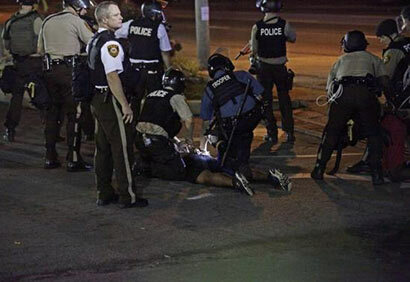 Law enforcement officials have been widely criticized for using excessive force. Two children were treated and released from a hospital for injuries caused on Sunday night by tear gas exposure, the St Louis Children’s Hospital said. So much for the media freedom by the Americans, and they are the self appointed human rights champions, and media freedom watchdogs ! what a joke! But they will be in a hurry to issue statements if a Sri Lankan journalist is stopped by a SL policeman. This is the time for American Blacks to seek autonomy and have their own independent state. This racial discrimination on American black people cannot be tolerated anymore. An “independent international” investigation must be immediately called through disgraced outgoing UNHCR chief “pillay” to find facts on this “Black genocide”. UNHCR don’t have to go inside USA to investigate. They can do an full investigation on this incident while staying outside USA just like they do their investigations on SL while being outside SL. Also, HRW and Amnesty International must be immediately waken up from their deep sleeps and wear some glasses over their “blind eyes” to issue statements condemning American racial discrimination.